I recall feeling excited, as I watched my neighborhood in the south Chicago suburbs dwindle below the wing of the Southwest Air 737. 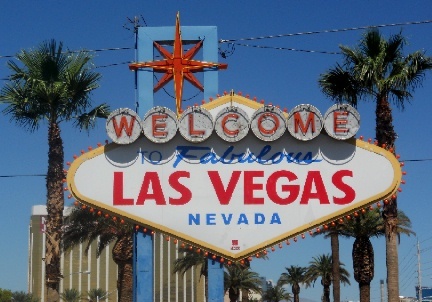 I was heading to Las Vegas for the first time as an adult, attending a legal seminar and intending to check off this item from my personal “bucket list.” I would be in “Sin City” four days, and largely on my own, to experience and explore. 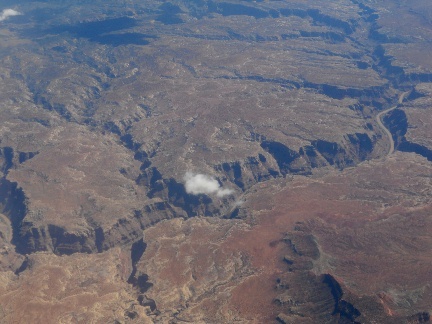 The view from my window seat on the 3 ½ hour flight gradually changed: from urban landscapes of houses, schools and businesses, to vast lonely farmlands, and finally to the desolation of canyons, mountains, and flatlands of southern Nevada. The State is quite impressive, even from 34 thousand feet. I wondered at all those souls who made this trip overland during the California Gold Rush and the Dust Bowl, and thought what a miracle my flight would have been to them. My first impression, as I walked the jetway into McCarran International Airport, was how hot and dry Vegas was compared to Chicago in September. I had expected the heat, of course, but was still mildly surprised at the intensity of it. Once inside the terminal, the air conditioning was about able to keep up with the hot desert sun. Heading to baggage claim, I was almost immediately overwhelmed by the vast numbers of chromed slot machines that seemed to fill every hallway and concourse. 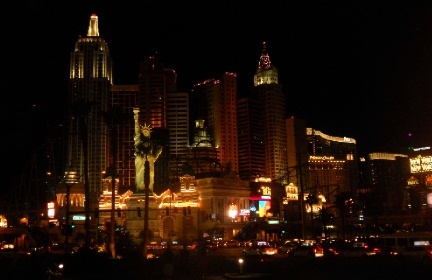 It’s not true insight to remark that Vegas is a shrine to gambling, nor is it unexpected. 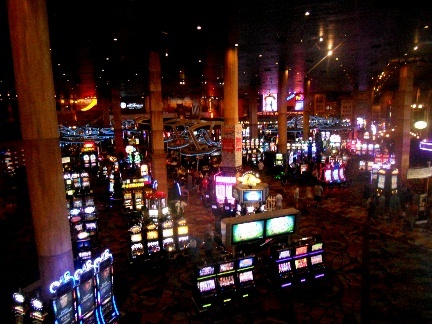 But the quantity and variety of available gaming, at all hours, make our local Midwest casinos seem quaint by comparison. During my stay, I managed to keep my suite pretty cool by blasting the air conditioning on high, and leaving it that way throughout my visit. I also kept the large bathroom closed, figuring I didn’t need to keep it as cool as the sleeping areas. It seemed to work pretty well, and heat really wasn’t an issue. As I look back on it now, my strongest memory of that first day (and even those that followed), is the scent of the Tropicana and other casinos I visited on my first night in Vegas. To me, it was a combination of citrus air freshener and the stale cigarette smoke from over 50 years of tourists and staff. While not unpleasant, it did take some getting used to. Overall, the casino/resorts along Vegas’ south Strip were like the rat pack movies of the early ‘60’s brought back to life. Certainly, the introduction of cell phones and wireless devices (nearly everywhere), does much to destroy this illusion. Yet the piped-in music, décor, and atmosphere hearken back to this earlier time. Indeed, I feel the casinos cultivated this connection, a sentimental tie-in to the golden days of Vegas from those bygone years. A sort of Vegas kitsch to my mind. Talking to some of the local staff and guests who remember those days, I was struck by the passion they have for that Vegas. Simpler times, when the Flamingo and Golden Nugget were two of the few casinos in operation. It’s gotten pricier and more crowded, they say, but there is something about this Town that draws them here. 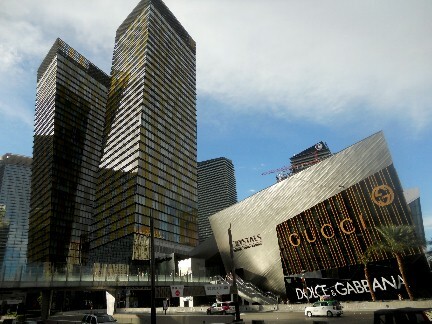 The Strip itself is a study in contrasts. Walking from the bright desert sunshine into the cool darkness of the casinos, you will find a unique mixture of high energy passion and dull lethargy at almost any hour of the day or night. Groups of younger couples passionately gathered around a roulette table are distinct from the solitary slot machine players, lost in their world of spinning wheels, lights, and sounds. The mad passion of a night in New Orleans during Mardi Gras, yet within a few feet, the heavy solemnity of the morning after Fat Tuesday in the Big Easy, and all under one roof. It was, to me, a strange vibe. I suppose it was inevitable that I would find myself considering my views alongside those of Hunter S. Thompson’s experience in “Fear and Loathing.” As a long time Thompson fan, his weird tales were running through my mind as I walked the streets and casinos. I can’t hope to compare my experiences to those of the Great Dr. Gonzo in any manner, but I guess I felt some of that energy he wrote about, even now, some 40 years later. Vegas, if nothing else, is enduring. The food at the hotels is quite spectacular, and any visitor should try at least one gourmet meal. 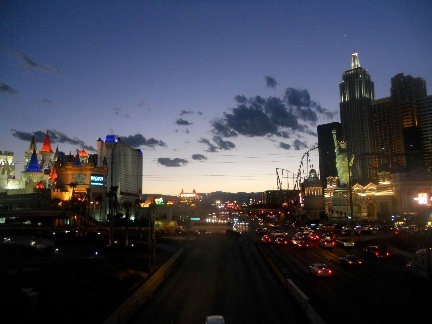 Aside from taking a shuttle from the Airport, I walked to most attractions along the Strip. The pedestrian walkways make navigating downtown Vegas an easy proposition, but double check the advertising handouts you are frequently given before slipping them into your suitcase! These are often pictures of scantily clad “escorts,” and not appropriate souvenirs for the younger members of your household. I broke even with the Vegas casinos on my trip, which I’m quite proud of. Still, part of me regrets not putting down a last big bet on my lucky number as I was heading back to my airport shuttle. If it hit, the winnings would have paid for the entire trip, plus a few more. When I return next time, I’ll be more of a Vegas veteran than wide-eyed tourist. This City has room for both. If I might have enjoyed it more with the company of family or friends, it was a fun experience without the constant negotiations and compromises such company inevitable requires. Las Vegas is the ancestral home of American gambling. It continues on as our most electrifying example. Everyone should experience Vegas at least once, if only to check it off their bucket list. 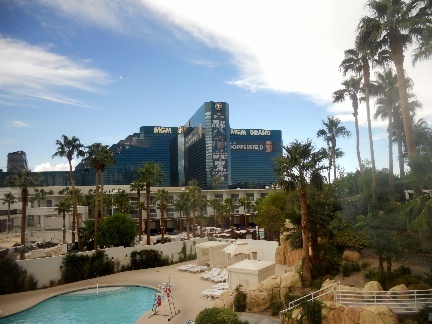 This Post was posted in Travel and tagged air travel, casino, casinos, gambling, gonzo, hunter thompson, las vegas, nevada, nostalgia, the strip, travel, tropicana, vegas, vegas strip. Bookmark the permalink.